Do some research. Read all about past and current inventions that have had a great impact on society. Create your own video about an invention. 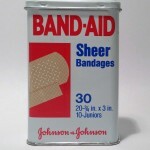 You can make it like the Ted Talk on the band-aid or be creative. Or Invent your own “gadget” at Kids.com.